The Sheridan Piano Trio, comprised of German pianist Moritz Winkelmann, American violinist Elizabeth Fayette and Danish cellist Carl-Oscar Østerlind, is a young piano trio characterized by performances which are both charismatic and insightful. Drawing from its individual member’s diverse backgrounds and rich experience, the Sheridan Trio is able to create interpretations which combine the best of their American and European training. Formed in summer 2013 at the Ravinia Festival’s Steans Music Institute, the Sheridan Trio made their European debut in February 2014 at the Royal Danish Academy of Music in Copenhagen. 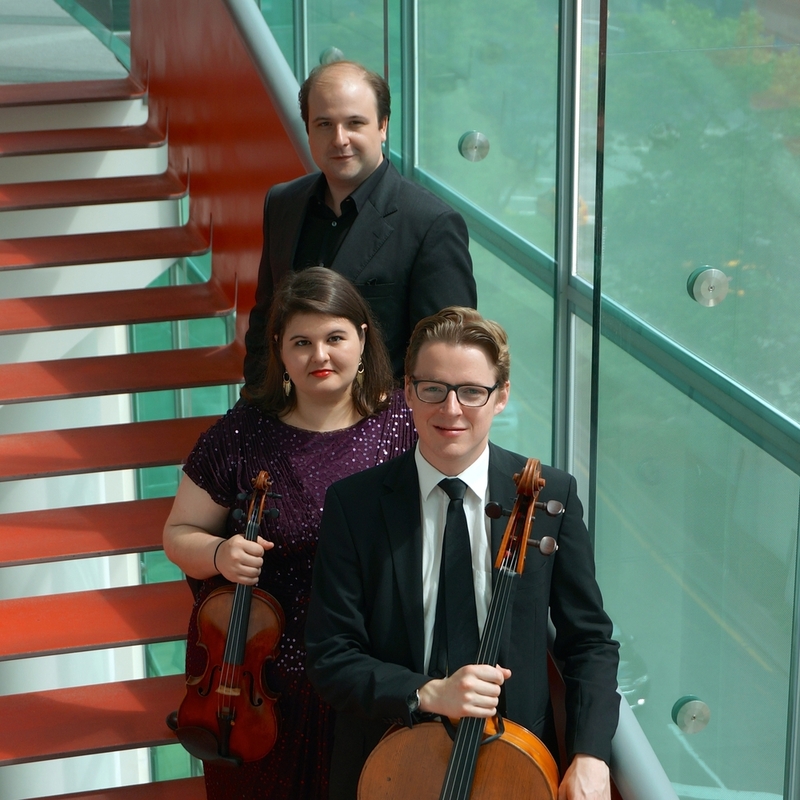 The Sheridan Trio’s 2014-2015 season includes concerts in both Europe and the United States. Danish cellist Carl-Oscar Østerlind, lauded for his “lyrical and vigorous tone” by the jury of Sweden’s prestigious Ljunggrenska Soloist Competition, of which he was a 2010 prizewinner, is quickly building a career both in Denmark and internationally as a soloist and chamber musician in possession of great versatility, charisma and directness of communication. Praised for his “incredible presence” in the Danish newspaper Politiken, Mr. Østerlind’s qualities have been recognized with many awards, particularly as the first prize winner of the Danish String Soloist Competition 2010. Upcoming engagements include a period as guest assistant principal cellist with the Copenhagen Philharmonic during their summer residency at Copenhagen’s Tivoli Gardens, as well as concerts with the Ensemble Mutatis. German pianist Moritz Winkelmann has been praised by audiences and critics alike for his enormous range of expression and pianistic facility. He has concertized both in his native Germany and internationally as a soloist and chamber musician, and his playing has been lauded in the Mannheimer Morgen as possessing “resilience and compelling sound balance.” This past October, Mr. Winkelmann gave an acclaimed performed Brahms Piano Concerto No. 1 with the Mannheim Philharmonic Orchestra. He will continue his relationship with the orchestra with chamber music concerts this upcoming summer as well as further solo appearances in the 2014-2015 season. Mr. Winkelmann’s festival credits include performances at Menlo, Schleswig-holstein and the Ravinia Festival. American violinist Elizabeth Fayette is quickly building a reputation as a soloist and chamber musician with a unique and charismatic style. Ms. Fayette has performed throughout Europe and the United States, most recently with the Houston Symphony as a prizewinner in the 2013 Ima Hogg Competition. She made her Carnegie Hall debut in October 2013 performing Bartok’s Violin Concerto No. 1 with the Juilliard Orchestra and Mo. Alan Gilbert. Ms. Fayette was also recently awarded a Second Prize in the 2013 Young Concert Artists International Auditions. Her most recent festival appearances include the Kneisel Hall Chamber Music Festival, Music from Angel Fire, the Sarasota Music Festival, the Aspen Music Festival, and the Ravinia Festival’s Steans Music Institute. In summer 2014, she attended the Marlboro Music Festival.